PXG 0311 Gen 2 irons review: three years on from their original 0311 iron, PXG release four new models of iron for 2018. Learning about and testing the new @pxg 2nd generation 0311 irons today. Serious forgiveness packed into a slim body! PXG were adamant they would not bring out a new line of clubs until they had a product that could boast significantly better performance. They weren’t going to simply change the paint job, produce a new marketing campaign and roll out the next generation. This iron range comes three years after the unaugural package, an age in the golf equipment landscape. Feathers were ruffled with the launch of the original 0311 iron - and that’s an understatement. We were hoping for something similar with the new set. There are four irons in the line-up - Tour, Players, Xtra Forgiving and Super Game Improvement - although the latter is not yet available. We visited Sunningdale Heath Golf Club, and went through the new line with a master PXG fitter. We tried a number of shafts in the irons, with each head, to find the best option - which was the Project X LZ 6.0, the same we have in our current set. Overall aesthetic is more consistent throughout the Gen 2 line of 0311 irons from @pxg. On top here is the extra forgiving iron, below is the players version. More so than the first generation, this line has a more consistent appearance. Between the P and T irons you will struggle to see the difference when addressing the ball. This makes blending sets even easier. As you would expect, the P and T are sleeker designs for better ball strikers, while the XF is a confidence boosting design. Overall the line is a bit more compact, with thinner top lines and less offset. The XF iron has a fairly sizeable sole, but the main body and topline still look superb. Better players shouldn’t have a problem - heck, Pat Perez plays a full set. Incredibly soft off the face, but also really full bodied. It’s as if designers took the feel from the original 0311 iron and turned it up. It’s powerful off the face, but doesn’t feel like you’re striking fliers. When you miss the sweet spot it’s incredible how little feel is impacted. The headline isn’t distance, it’s forgiveness with the PXG 0311 Gen 2 irons. 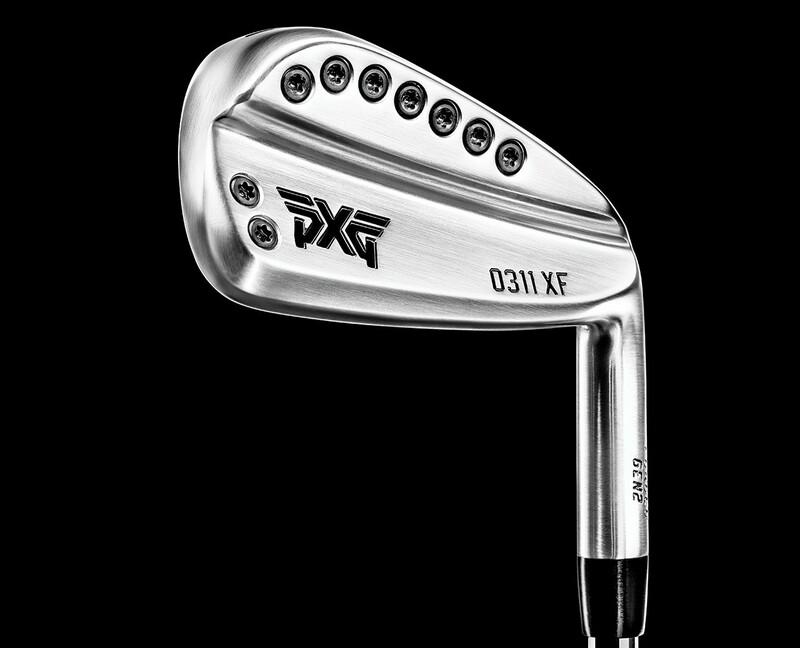 A thinner face is complemented by PXG’s “secret sauce” - COR2 which is put in the cavity - to take the forgiveness to unparalleled levels in an iron that looks like this. The sweet spot is noticeably larger. With off centre hits, ball speeds were still staying high, and we were hardly losing any yardage. Particularly with the XF, we felt like we could miss hit the shot, and we would be landing near enough pin high. The consistency is also incredibly. Cavity irons - particularly those with a material in the hole - are prone to shooting out some massive ball speeds once in a while. Great for showing off, but not conducive to good golf. The PXG 0311 Gen 2s are on the number every time. While distance isn’t the major improvement, we did get a little extra ball speed and total distance across the range. While the T and P models do have a little less forgiveness, it’s almost hard to tell as they pack a serious punch in their own right. The XF did give us more distance, and launched slightly higher than the other models. Staggering forgiveness and consistency. The feel is smooth and soft, while the looks will appeal to all levels of player. It’s a clear improvement on the first set of irons, as PXG promised. The feel is intensified, while the sweet spot has bled to a mammoth size on all models. The performance in the XF irons is so good, low single figure players may even be tempted. We suggest you give each model a decent look in before landing on one, as the performance is so exceptional in every category with each model. The PXG 0311 Gen 2 irons offer game improvement performance and a forged feel in a player’s chassis.